Millie LaRue is now cooking for a cause! This unique charity cookbook brings together over 350 recipes for people and their pets. There are 7 chapters devoted to recipes for PEOPLE and 1 chapter dedicated to DOGGIE FARE. Millie LaRue’s friends from every corner of the world sent in their favorite recipes, many of them SECRET FAMILY RECIPES…now you can experience these dishes without ever leaving home. 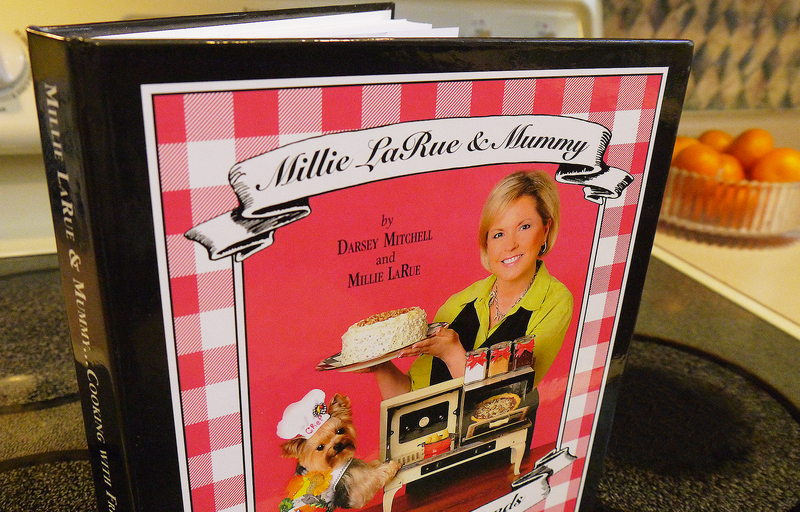 A portion of the profits from this cookbook will be donated to animal rescue and shelter organizations that Millie has become involved with through her many travels. The book is now available for immediate shipment and makes the perfect gift for anyone. So buy the book…discover new flavors…and support doggie rescue organizations!!! I LOVE this cookbook! The tomato pie is fabulous…I am looking forward to having fresh, ripe tomatoes from my garden so I can make it again. I also love the shrimp dip, the baked potato soup, and the salmon cakes. There are so many more to try!